It's official! Construction has begun at Villas at Magnolia Lakes. 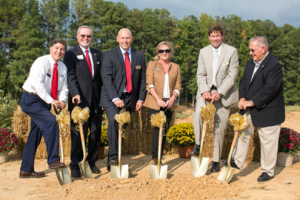 Cornerstone Homes officially broke ground on our new models at Villas at Magnolia Lakes on October 1st. In addition to the ceremonial on-site groundbreaking, there was also a champagne toast in The Magnolia Club community clubhouse led by Roger Glover, the owner of Cornerstone Homes. VP of Operations for Cornerstone Homes, Brian Schwindt, emceed the event, which featured remarks by Will Davis, Jr, the Director of Economic Development for Chesterfield County; Peter Larsen, from the Chesterfield Chamber of Commerce; and Ed Newman, a current homeowner at Villas at Magnolia Lakes. Special guests included Chantelle Bradley from the Chesterfield Chamber of Commerce; Greg Allen, the Chesterfield County Planning Manager; Jeff Lamson, the Chesterfield County Senior Planner; Randy Blitz from Higgins and Gerstenmaier Landscape Architects; Andy Scudder from the Johannas Design Group; and Jeanie Bode, Senior Vice President at First Capital Bank. We're so excited for what's ahead! Come see what's going on at Villas at Magnolia Lakes for yourself! The Sales office is open daily from 10am to 6pm; Sunday 1pm to 6pm.